TRAVERSE CITY — Sleeping Bear Dunes National Lakeshore’s landscapes and waterways call out to the inner explorer — and also to private commercial companies. Distinctions are made between operating inside or outside the park and large or small scale businesses. Businesses located within the park making $25,000 or more would give the park a percentage, but there’s only one business inside park boundaries — a campfire wood vendor — with gross receipts less than the mark. Large-scale, “necessary” operations are given 10-year concession contracts, like Manitou Island Transit, which ferries passengers to the park’s North and South Manitou islands. The bulk of park businesses operate under a commercial use agreement, geared for small-scale ventures that operate outside the park — like a paddle shop — yet use it. The park’s Chief Ranger Phil Akers manages Sleeping Bear’s commercial approval process. The park receives no revenues from the private companies other than the $250 application fee, he said. Then there are rules: commercial operations to be sustainable, safe, and protect park resources without interfering with other guest experiences. Business guests must pay the park entrance fee. Companies submit an annual report detailing operation volume and revenues. Authorizations are reviewed every two years. The park may also add individual stipulations. Cedar- and -Florida-based All About Water owner Jeff Gagie received permission in 2014 to deliver and pick up rental kayaks and standup paddleboards. 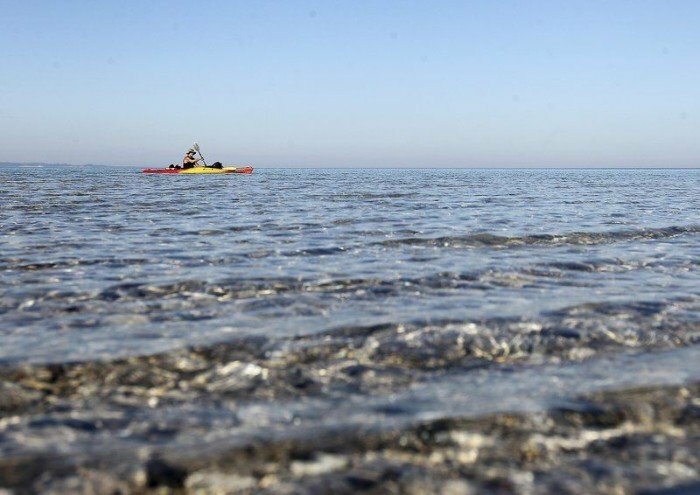 This summer he will add guided kayak tours along the Lake Michigan shoreline past Pyramid Point, the Pierce Stocking Overlook and Good Harbor. Gagie’s guides will be trained by credentialed American Canoe Association instructors. Tour groups are capped at 12 kayakers per guide. Kayaks must be carried to the water access site or wheeled along paths to avoid site degradation. And Gagie is currently identifying sites in western Leelanau County to launch tours allowing him to comply with the mandate prohibiting the company from initiating or ending tours within the park. Gagie joins a cadre of businesses. Crystal Properties of Glen Arbor offers guided canoe and kayak tours on inland waters. Kiteboarding lessons are available from Broneah Kiteboard of Traverse City. Yoga sessions, standup paddleboard lessons and guided tours are options offered by Fluid SUP of Cedar. The Cyclery of Glen Arbor hosts guided snowshoe and cross-country skiing adventures. Lake Ann Hardwoods sells campfire firewood and Northport’s Parkland Peace settles cremated human ashes by casting them into the air or spreading them onto the ground. Farther from home, Missoula, Montana– based Adventure Cycling Association offers week-long cycling tours and Sierra Club Outings of San Francisco provides hiking and biking trips. Businesses promote the park, which is good for everyone, Gagie said.